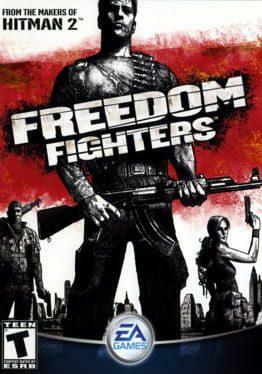 Freedom Fighters is a third-person shooter, in which the player navigates through the streets of New York while fighting the Soviet forces. The game also contains squad-based elements, having a charisma meter. The player gains charisma by performing heroic deeds in the resistance movement against the invading forces, like capturing a base or destroying vital supplies. The more charisma that is gained, the more squad-mates the character can recruit, including leaderless guerrillas and wounded Russian soldiers, up to a maximum of twelve. Freedom Fighters uses a simple method of controlling recruits in battle. In the game, the player can command recruits by giving them simple orders such as "follow", "attack" and "defend", but in most situations, they take care of themselves. Given the terrain of New York City after the initial invasion, the Resistance usually stations its soldiers in covered positions like craters and buildings. Freedom Fighters is available from 9.99 to 9.99 from 1 shops.